At first glance the surface of a glacier hardly seems hospitable. Cold, barren, and windswept, glaciers appear to be the antithesis of life. However, this assumption is completely completely false. Glaciers are home to an interesting ecosystem of their own, albeit on a smaller scale than we normally give attention to. From pockets of water on the surface to literal lakes of water sealed away inside, glaciers are home to a myriad microbial life. On some glaciers the life even gets a bit larger. Glaciers are littered with debris. As dust and gravel accumulate on the surface of the ice, they begin to warm ever so slightly more than the frozen water around them. Because of this, they are readily colonized by mosses such as those in the genus Racomitrium. The biggest challenge to moss colonizers is the fact that glaciers are constantly moving, which anymore today means shrinking. As such, these bits of debris, along with the mosses growing on them, do not sit still as they would in say a forest setting. Instead they roll around. As the moss grows it spreads across the surface of the rock while the ice rotates it around. This causes the moss to grow on top of itself, inevitably forming a ball-like structure affectionately referred to as a "glacier mouse." Because the moss stays ever so slightly warmer than its immediate surroundings, glacier mice soon find themselves teaming with life. Everything from worms to springtails and even a few water bears call glacier mice home. In a study recently published in Polar Biology, researcher Dr. Steve Coulson found "73 springtails, 200 tardigrades and 1,000 nematodes" thriving in just a single mouse! 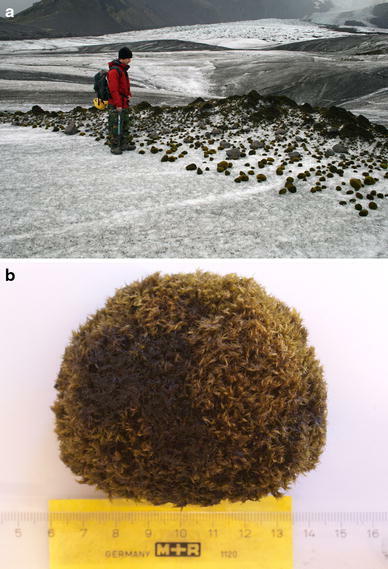 The presence of such a diverse community living in these little moss balls brings up an important question - how do these animals find themselves in the glacier mice in the first place? After all, life just outside of the mouse is quite brutal. As it turns out, the answer to this can be chalked up to how the mice form in the first place. As they blow and roll around the the surface of the glacier, they will often bump into one another and even collect in nooks and crannies together. It is believed that as this happens, the organisms living within migrate from mouse to mouse. The picture being painted here is that far from being a sterile environment, glaciers are proving to be yet another habitat where life prospers.